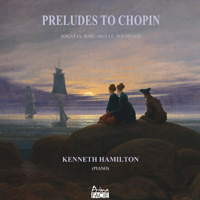 Following the widely admired 'Back to Bach' and 'Ronald Stevenson' recordings by Kenneth Hamilton, Prima Facie are proud to present 'Preludes to Chopin', his remarkable new CD. The recording features the great Chopin Sonatas and the Barcarolle, along with two rarities: Busoni’s dramatic reworking of the “Heroic” Polonaise, and a hauntingly nostalgic version of the Chopin/Liszt 'My Joys', played according to Liszt student Bernhard Stavenhagen’s “personal memories of Liszt”. The CD is accompanied by Hamilton’s own detailed notes on the pieces and their performance. For more details of this recording, please download the CD booklet. Described after a concerto performance with the St Petersburg State Symphony Orchestra as “an outstanding virtuoso- one of the finest players of his generation” (Moscow Kommersant), by the Singapore Straits Times as "a formidable virtuoso", by Tom Service in The Guardian as “pianist, author, lecturer and all-round virtuoso”, Scottish pianist Kenneth Hamilton performs worldwide as a recitalist, concerto soloist and broadcaster. He has appeared frequently on radio and television in Britain, the US, Germany, France, Singapore, Canada, Australia, Turkey, China and Russia, including a performance of Chopin’s first piano concerto with the Istanbul Chamber Orchestra on Turkish Television, and a dual role as pianist and presenter for the television programme 'Mendelssohn in Scotland', broadcast in Europe and the US by Deutsche Welle Channel. He is a familiar presence on BBC Radio 3, and has numerous international festival engagements to his credit. His recent recordings for the Prima Facie label, 'Volume 1 of Kenneth Hamilton Plays Ronald Stevenson' and 'Back to Bach: Tributes and Transcriptions by Liszt, Rachmaninov and Busoni', have received widespread critical acclaim: “played with understanding and brilliance” (Andrew McGregor, BBC Radio 3 Record Review); “an unmissable disk…fascinating music presented with power, passion and precision” (Colin Clarke, Fanfare);“precise control and brilliance” (Andrew Clements, The Guardian); “thrilling” (Jeremy Nicholas, Gramophone); “a gorgeous recording and excellent performance” (Jack Sullivan, American Record Guide); “provides the ultimate in energetic impact, taut tempi and gripping creative command” (Stefan Pieper, Klassik Heute). Kenneth Hamilton is Head of the School of Music at Cardiff University in Wales, UK. He himself was a student of Lawrence Glover and Ronald Stevenson, the latter of whom inspired his interest in the history of piano performance. Hamilton is especially fascinated by the captivatingly varied performance styles of the pianistic “Golden Age” from Liszt to Paderewski, which constitute for him a well of stimulating artistic ideas, rather than models for exact imitation, a position argued in his book, 'After the Golden Age: Romantic Pianism and Modern Performance' (Oxford University Press). This was a classical music best-seller, welcomed as “full of wit and interest, and written with passion” by Charles Rosen (Times Literary Supplement), and as a “deft and sympathetic account of the old school virtuosos” by Alex Ross (The New Yorker). It was a Daily Telegraph Book of the Year in the UK, a recipient of an ARSC award, and a CHOICE Outstanding Academic Title in the US.